Neville Wardle’s Page | CTRiumph! What do you get if you take 24 British cars, add driver and navigator, stir in some petrol, set them loose on the roads of New Hampshire and Maine and spice it up with a few laps of a racetrack? Well, on the weekend of September 9th and 10th you got a lot of very happy people and over $16,000 in donations for the Boston Children’s Hospital. This was the inaugural run of the New England edition of the American British Reliability Run. I explained last month how British car manufacturers developed the concept of the Reliability Run, which has since passed into the British car hobby thanks to the efforts of Club Triumph in the UK. The concept crossed the Atlantic thanks to Blake Discher of Detroit and most recently has been kept alive by the efforts of Dave Hutchison and the Delaware Valley Triumphs who have now organized seven Reliability Runs. I listened to Dave talk about the Reliability Run at the VTR convention and decided right there that I would participate. A scheduling conflict meant that my Navigator couldn’t do the PA run so we signed up for the inaugural New England run which was organized by Bob Dougherty of the British Cars of New Hampshire group. The event started on Friday morning, September 8th, with a driver’s meeting at Historic Motor Sports in Candia, NH. Susan and I had driven up to Manchester, NH the night before to make sure we arrived on time. We pulled into the car park a few minutes before nine and were immediately impressed by the lineup of cars waiting to set off on the run. MGs of various vintages dominated the scene but there was plenty of variety running the gamut from a sumptuous 1954 Bentley R-type Continental to your editor’s cheap and cheerful 1979 Spitfire. All cars and crews shared a desire to be off and on the road, but the drivers’ meeting came first. Bob Dougherty did an outstanding job of organizing the event from beginning to end, and we were not setting out without a thorough briefing. Each crew was issued with a road book which gave very clear details of the route, which Bob had driven four times to ensure the accuracy of the directions. We were organized into three flights of eight cars to give us a fighting chance of staying together, any potential problem areas such as rough roads or awkward intersections were pointed out and then off we went. Southern New Hampshire is perhaps not quite in the same league as the northern part of the state when it comes to scenic roads but the route led us along some fairly quiet byways as we made our way to our lunch break at Kathleen’s Cottage Irish pub in Bristol, NH. The pub did a very good job of accommodating our group of about 50 people, the menu was nicely varied and the portions were extremely generous, to the point where my lunch was also my supper that night! Suitably refreshed we got back on the road and headed north towards the White Mountains. We ran into a slight obstacle 43 miles into the afternoon’s run when a bridge that was noted as under construction turned out to be closed to traffic. Our flight leader knew a good detour that returned us to the route a few miles further on. Bob Dougherty commented later that the person in charge of the construction had assured him that the bridge would not be closed! Our mid-afternoon stop was at The Brick Store in Bath, NH. This is apparently the oldest general store in the US, one of several to make the claim. The Brick Store’s main claim to fame appears to be home-made fudge, so we bought a box of it. I am not saying the fudge is rich or heavy but I swear the Spitfire lost a couple of miles per gallon after we took it on board. After a quick drive through the covered bridge we left town under threatening skies with a beautiful double rainbow in the distance. It was not very long before we pulled over for most teams to erect their weather gear. Team A.T.W.A.R. decided that the rain would not last long and would have little effect if we kept moving. And so it was apart from a steady drip off the driver’s side sun visor that landed on my left knee. After about 15 minutes the rain stopped and we had an uneventful run through Franconia Notch and on to the Indian Head resort which would be our base for the next couple of evenings. We checked in, checked out the bar which had Goose Island IPA on tap and eventually went to locate our cabin and button the Spitfire up for the night. 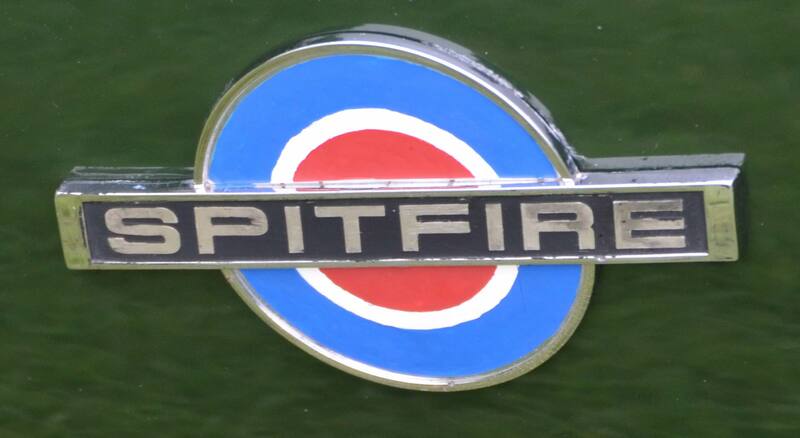 The Spitfire had been running fairly well thus far, but things took a marked turn for the worse on Saturday morning. To borrow a phrase from Rolls Royce, the car failed to proceed. Despite the best efforts of some talented people, the failure to proceed persisted and I was offered the use of the Car of Shame (which turned out to be one of those rather large MINIs). I immediately declined the offer and vowed to get the car running. These bold words of course then needed to be backed up, and as the Spitfire Chronicles elsewhere in this issue relate, I did get as far as working out exactly why the car had decided to stop starting. The problem now became one of finding a replacement wire so that the coil’s high tension could make its way to the distributor. I decided this was best pondered over breakfast and coffee, and we set off from our cabin to the hotel. I explained to Earl what the problem was, and he went back to his truck, returning a minute or two later with a distributor cap from which dangled four bright yellow plug wires. “It’s off an MGA but we can probably make something out of it.” And so we did. Earl cut the end terminals off, trimmed the insulation back, I salvaged the boots from the useless coil wire and we were in business. Breakfast was now the last thing on my mind. We’d given our flight a good hour’s start, now off we went in hot pursuit, up through Franconia Notch, looping back through Lincoln and then over the joyous road that is the Kancamagus Highway. We could set our own pace and with Earl’s magic wire the Spitfire responded beautifully. The excellent road book was worth it’s weight in gold as no longer was there a flight leader to follow. Now the Navigator earned her keep, reading the directions to me. Some of course could be ignored to make up time: “in 9.1 miles there is a scenic overlook opportunity” “There’s enough scenery without any overlook” “There’s a bathroom break in a couple of miles” “We don’t need no stinking bathroom break” And at 78.3 miles, at an Irving gas station, we found our flight fueling up and were welcomed with a cheer. We were back in the game. The rest of the morning was somewhat more sedate as we made our way to the Jolly Drayman in Bethel, ME. Having skipped breakfast the lunch was most welcome before we set off on the 90 mile run back to Indian Head via Wildcat Mountain, where those with a head for heights took a gondola ride. Then we were back on the road, up through Crawford Notch, past the Mount Washington Hotel and into Franconia Notch where it got rather chilly and started to rain. Once more while all around hastily put their hood up we decided we could run through the rain and the cold. There’s generally a fair amount of engine compartment heat wafting back through the bulkhead and the Spitfire’s heater is actually quite good, so I was warm enough. The Navigator seemed to think a blanket was needed, although that might have just been to keep the road book dry. I didn’t quite catch her reply when I asked, it was something about a hole, which didn’t make much sense at the time. Once we had dried off we enjoyed pleasant company in the bar with some of the other teams. Events like this or the recent VTR convention are great social gatherings with a chance to hear new stories, discover what other car clubs are up to and so on. You can also learn what other cars are like to own and drive and learn about repair techniques, maintenance tasks and so on. There’s generally no shortage of conversation about British cars whenever three or four enthusiasts gather. And so to the final day with the destination Historic Motor Sports in Candia, where it had all started. The run was not direct however, because we had an appointment at the newly opened racetrack in Tamworth NH. Off we went for the relatively short stage that took us to Club Motorsports. After we all signed waiver forms and listened to a short briefing we were led to the track and then enjoyed four laps where, within reason, we could let our cars stretch their legs. The track was well laid out but I found it difficult to concentrate on driving because the vista of the mountains in the distance is a superb sight. Was it fun? It was enormously fun. Would I do it again? I would most certainly sign up for this event again. In fact, I am exploring the possibilities of organizing a Connecticut edition of the Reliability Run and will be talking to Dave Hutchison and Bob Dougherty to see how a CT Run might integrate with the existing events. In the meantime there are memories to linger over this coming winter, work to do on the car to sort out the minor issues that arose and dreams to have of what might be in store for Team A.T.W.A.R. in 2018. In closing I would like to thank the C.T.R. and member Sam Patterson for their generous support of the Reliability Run.